I'm learning that this time of year is a little crazy here in Colorado. One day it is a bright, sunny 70 degrees and the next brings piles of wet, heavy snow. I kind of love it. I'm a winter girl who loves being cozy in the house with something delicious cooking on the stove or in the oven. But I also get to the point where vitamin D is a necessity. And it must be in the form of beautiful, hot rays of real live sunshine. Spring in Colorado also means that crazy hot weather is not far behind. Last year it was far too warm to use the oven in our house. (We have a tiny swamp cooler that barely keeps half of the house at a comfortable temperature.) So, I'm trying to get all the oven time that I can under my belt before it's too much to bear. This means baking buttermilk drop biscuits, Irish soda bread, and roasting lots of vegetables. This soup was the result of a big sheet pan of carrots, onions, and garlic that I drizzled with honey and roasted for about an hour. Everything was perfectly soft and golden brown with a honey glaze that gave a subtle sweetness to offset the rich roasted flavor. I simply took the roasted vegetables and tossed them in a pot with some chicken stock (just like I do for my Butternut Squash & Coconut Soup). 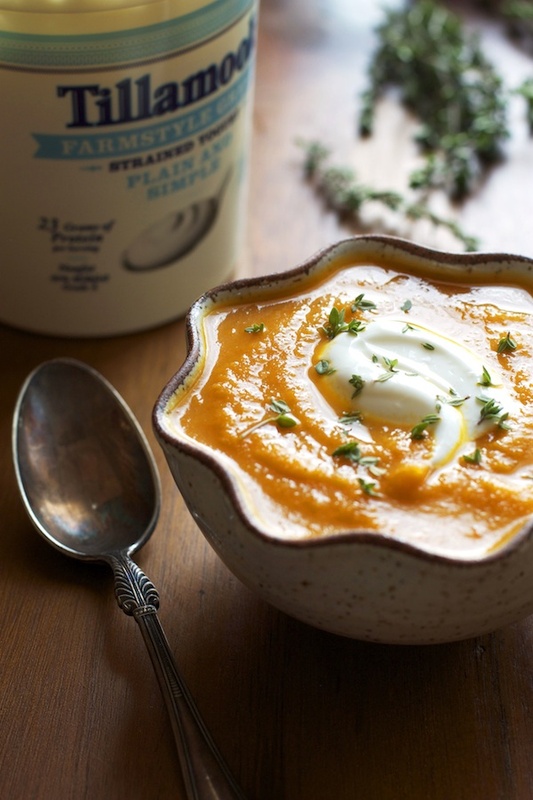 After it all simmers together for about 10 minutes, I take my immersion blender and transform it into a creamy, luxurious soup that is perfect with a dollop of creamy Greek yogurt and a few fresh thyme leaves. It's just so. darn. easy. Can we talk about Greek yogurt for just a moment? I love it. I eat it pretty much every day. So when I got the chance to get a first taste of Tillamook's new Farmstyle Greek Yogurt I was thrilled. I used the 0% Farmstyle Greek for topping this soup and it is creamy and rich and has no hint of being fat free. Check out my Instagram feed for more photos of the flavors I'm trying. They've all been such a treat! My favorite so far is...wait for it...CINNAMON HAZELNUT. Perfect. Line a large rimmed baking sheet with aluminum foil. In a large bowl, toss the vegetables with the spices, honey, olive oil and a bit of salt and black pepper. Spread the vegetables onto the baking sheet in a single layer. If you need to, use two baking sheets so the veggies aren't crowded. Roast the veggies for 45 minutes-1 hour or until nicely softened and golden brown. Stir every 20 minutes to ensure even cooking and to avoid burning the honey. Add the rest of the vegetables and the stock to the pot and place over medium heat. Bring to a simmer and cook for 10 minutes. Use an immersion blender and blend until the soup is nice a smooth. Alternately, you can work in batches, pureeing the soup in a blender. Be very careful as hot liquids may explode out the top of the blender. Add the lemon juice. Taste and adjust seasonings as needed. 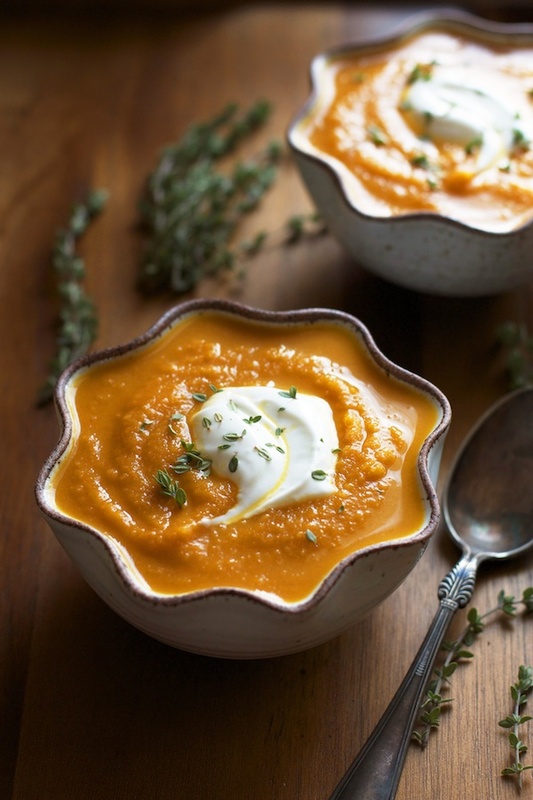 Ladle the soup into serving bowls and top with a dollop of Greek yogurt and some thyme leaves.